Tide Pods, Magnetic Laundry Tablets or the EcoWasher? Doing the laundry isn’t a task I particularly enjoy. It is one of those time consuming chores I continually struggle with to fit into my schedule. And now that my kids are teenagers, the laundry needs to be done 4 or 5 times a week. My interest in the technology behind washing textiles however picked up recently after I was introduced to two methods of laundering clothes without detergent, the magnetic laundry system and the EcoWasher. Was it laziness or complacency? I had been given the magnetic laundry system over the holidays, but I was hesitant to try it out. 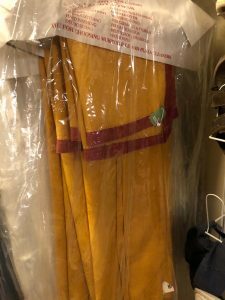 Although I had been using Nikken’s magnetic technology as a tool to heal physical injuries for decades, I was unsure about the ability for magnetics to wash clothing. 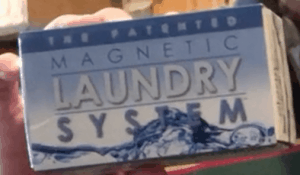 I played with the idea that maybe the water molecules, in being mini magnets themselves, would somehow align with the magnetic field created by the laundry magnets and that this could somehow make the water more potent at cleaning. But, I was skeptical. The blue magnets remained in their box on the kitchen counter for several weeks. Then, jokes about the Tide Pod challenge became a more frequent, disturbing conversation in my home at dinnertime. Although we were using a less toxic detergent recommended on the EWG website, it was then that I began to think that if these magnetic discs worked, it would be great way to remove another set of toxins from the household. You have no doubt heard that some foolish kids on the internet are videotaping themselves biting into and swallowing Tide Pods, a cute name for a pre-measured packet of Tide laundry detergent wrapped up in a shiny coating. The product is soft, colorful and swirled, and looks like a piece of candy. A similar appearing packet of dishwasher detergent is sold by Cascade, another Proctor and Gamble product. I haven’t heard of any YouTube videos of kids eating cascade, and I hope that doesn’t become the next dare! Yes the packaging is labeled, “harmful if swallowed”, but to a teen, isn’t that so boring? I mean EVERYTHING says that?! And to a younger kid who can’t read, the packets look like flavorful, fruity treats! Tide pods are poisonous. A sampling of 5 ingredients in the Tide Pod formula includes: linear alkylbenzene sulfonate, ethanolamine, alcoholethoxy sulfate, polyethyleneimine ethoxylate, disodium diaminostilbene disulfonate etc. The idea of a child swallowing this batch of chemicals is truly frightening. So, I took my chances, opened up the magnetic laundry system and ran my first load of laundry. I was pleasantly surprised. The clothes did come out clean and without any odor. And trust me, my 15 year old son can make clothing unbelievably rank after a day of exercising or doing track. I did notice on a few articles of clothing that there were faint stains, so the next time I washed them, I pre-treated those items with a stain remover. I have no problem with that for I often use a stain remover with my regular detergent anyway. I’ve been doing the laundry this way for five weeks now and I have decided that it works! Although it wasn’t something I was conscious of beforehand, I have also come to realize that our clothes no longer have the feel of, what I now recognize as being, dried detergent residue. I now realize that detergent ingredients have permeated my clothing for as long as I can remember. Some people claim that detergent is needed to kill viruses, molds and bacteria. I don’t have any experience with this. I suppose if I have clothing or towels that have mildew in the future and the magnetic system doesn’t clean them adequately, I’ll rewash them with detergent. But, I’ll cross that bridge when I come to it. If you are looking for a method to wash and sanitize your clothing without chemicals, there is another product on the market called the EcoWasher. This adaptor attaches to the cold water intake valve of your washing machine and infuses ozone into the water, sanitizing your clothing in a similar method to that used in hospitals.. The basic system, The EcoWasher Pro costs around $350 and is available here. It’s tough to break habits, and laundry is definitely an ingrained routine for many of us. In addition, advertisements and reviews often misrepresent and misinform, no doubt designed to make false claims of a product’s efficacy and to smear the reputation of competing interests. An old friend of mine expressed concern that he read on the Snopes website that the laundry magnets were proven to be a fraud. Over the years, I have noticed that this website, in particular, discredits pretty much anything and everything that isn’t status quo and pro-industry, including many products I love and have used for decades. I don’t make decisions based on the information from these types of sources. If a product sounds interesting to me, I try it out and make my own assessment. Sometimes I am disappointed, but other times I am very pleased. I have found that my joy in life often comes from my own exploration and discovery. So, I recommend you take a moment to think about your options for laundry. Yes, there are dozens of detergents to choose from, and there are also detergent-free alternatives. Itâ€™s not a trivial decision. The chemicals in these cleansers are clearly poisonous if ingested orally, but some of these toxins come in contact with your skin 24/7 from clothing, towels and bed linens. Some of these can be absorbed directly through your skin and insidiously affect your health. Consider this, especially, if you or someone in your home suffers from allergies or other types of inflammatory disease. I am very concerned about 3 chemicals many of us have in our homes that have been proven to be extremely toxic. Since Scott Pruitt and the EPA recently placed a “hold” on banning these chemicals, we must be cautious and extra vigilant to protect ourselves and our loved ones from these poisons. The Toxic Substances Control Act (TSCA) was created in 1976 in an attempt to clean up our environment and improve the health of the US population. The Act gave the EPA the authority to monitor and restrict the use of chemicals deemed to be environmental hazards. The most notorious toxins removed included asbestos, lead-based paint, and polychlorinated biphenyls (PCBs). Since the 1970s, tens of thousands of new chemicals have been developed by industry, placed in everything from paint formulas and food additives to personal care products. The original TSCA excluded chemicals used in food, drugs, cosmetics and pesticides! As a result, the health effects associated with long term use of these chemicals has not been determined. Meanwhile, the US population, as a whole, has been getting sicker each year. In 2016, the TSCA was amended by congress. The updated law calls for the health risk assessment of 10 new chemicals a year. Many of these compounds are found in common products we all use in our homes. One would think that this kind of scrutiny would have been performed prior to their initial approval, but it wasn’t. A year ago, on November 29, 2016, the EPA named the 1st 10 chemicals up for review. From the first test group, 3 chemicals discovered to be particularly toxic were named. But, they are not going to be phased out any time soon. Yes, these chemicals are known to be toxic and some cause cancer, but because the current administration doesn’t want to put any more regulations on business, Scott Pruitt and the EPA have delayed the ban of these 3 nasty chemicals…indefinitely! What are these 3 toxins? 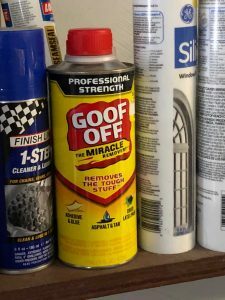 This organic solvent is added to paint strippers, paint thinners and other paint removal products. metal cleaning and degreasing products. It is volatile organic compound (VOC) and has a sweetish odor. Be cautious of inhalation and skin exposure. Acute reactions from methylene chloride exposure include confusion, dizziness, headaches, optic neuropathy and inflammation of the liver. There have even been several deaths attributed to inhalation. Long term, exposure to this chemical has been associated with cancer of the lungs, liver and pancreas in laboratory animals. This chemical has also been shown to cross the placenta! This organic compound is rapidly absorbed by skin, but unlike the other two chemicals in this list, this fluid is nonvolatile at room temperature. Paint and coating removal products and many other household products may contain this chemical, including cosmetics. Even oral and transdermal medications are sometimes prepared using this chemical to assist in drug absorption. This chemical easily crosses the placenta and exposure to this drug during pregnancy can cause terrible birth defects . This VOC is a colorless liquid used in adhesives, paint removers, typewriter correction fluids and spot removers, among other products. This chemical is commonly used by the dry cleaning industry and has even been used as an inhalation anesthetic for short surgical procedures. TCE has been determined to be carcinogenic to humans by all routes of exposure. It causes kidney cancer and there is evidence that it may also cause non-Hodgkin lymphoma and liver cancer. This chemical is also known to cause birth defects and developmental disorders. 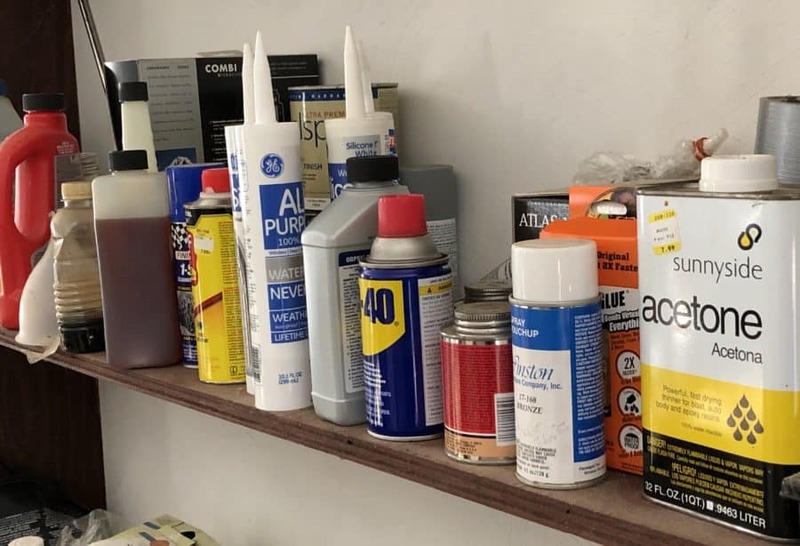 Follow these general precautions at home when using products such as a paint remover, adhesives, or any other products that emit VOCs. 1.Protect your skin and wear appropriate gloves. Latex rubber gloves used for dishwashing, medical gloves and food handling gloves are not adequate to protect yourself from these chemicals. Potent solvents can quickly dissolve through the material most gloves are made of and will subsequently absorb into your skin. A twinge in the nose, a strange sensation in the back of the throat, and/or irritation of the eyes will alert you that you have absorbed chemicals through your skin. Invest in a pair of laminated polyethylene/EVOH, butyl rubber or better yet, butyl/viton gloves to protect yourself from the most dangerous of these chemicals and always use them during potential exposure. Buy your gloves in advance and store them in the garage. 2. Maintain adequate cross ventilation or better yet, work outside when applying products containing VOCs. Many people don’t have a trustworthy sense of smell. Understand that you can still get sick from these products, even if you can’t smell them! Also realize that opening a few windows is not enough to keep the inside air from becoming toxic. If you use products containing these chemicals indoors for any prolonged period of time, run large fans in the room in addition to opening several windows. If this is not achievable, invest in a respirator with an assigned protection factor of 10 to reduce your toxin exposure. A NIOSH-certified air purifying elastomeric half mask respirator equipped with N100, R100 or P100 filters will minimize your inhalation exposure. 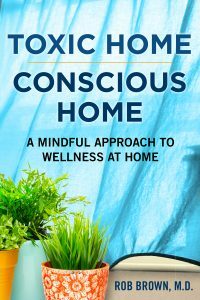 Check out my blog: A Breath of Fresh Air and read a frightening personal account of the health effects I experienced from inhaling household paint fumes. 3. Keep all product containers containing VOCs in your garage or in an outdoor shed! 4. Don’t take home dry cleaned clothes that have an odor or are still damp as they may still be off-gassing TCE. 5. Pregnant women should stay away from all paint products! In addition, be critical of any cosmetics you apply to larger surface areas of your body. Investigate your chosen cremes and moisturizers and make sure they don’t contain NMP. Although it is certainly disappointing that the EPA has decided not to protect US citizens and the environment as a whole from these 3 industrial toxins, we must all realize that these chemicals represent the tip of an enormous iceberg. We are surrounded by thousands of hazardous chemicals in our daily lives. As a consumer and homeowner, it is important to do your homework and protect yourself as best you can from exposure. Does Cellphone Distraction Cause Food to Stick in your Throat? Mealtime is often teeming with device distraction and I suspect digestion can be affected. Personal devices have completely consumed the attention of many during mealtime. While dining at a restaurant in the historic district of Rome, I recently witnessed a couple sit across from each other, both firmly grasping their personal devices. They couldn’t have spoken 10 words to each other during the entire meal. Each blindly reached for the table, grabbed a forkful of food, and mechanically fed themselves, while their vision remained focused on their respective screens. At first, I felt badly for this couple. They were oblivious to the ambiance. Their was no apparent personal connection with each other. I can’t imagine they were able to enjoy the taste and aroma of the delicious food they ordered. 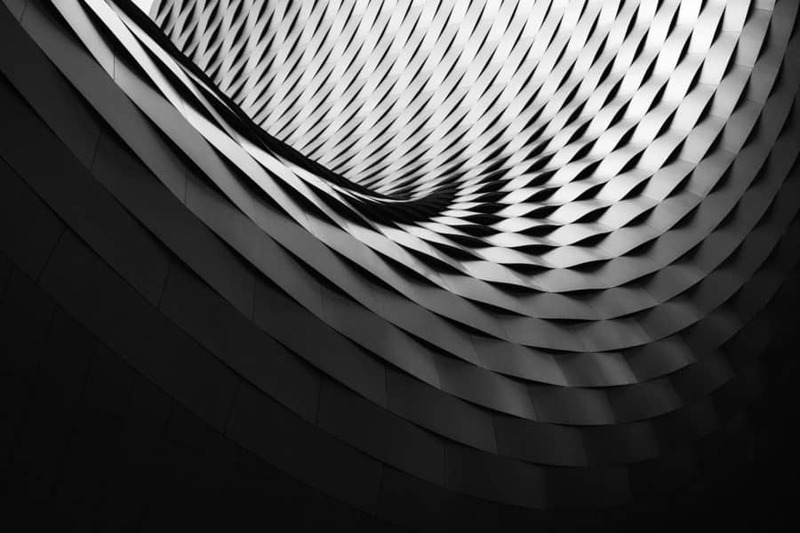 While focused on the little screens, their conscious awareness was brought into a reality apart from that which their physical bodies were experiencing. Much of what occurs in the human body is run on automatic pilot, through the autonomic nervous system. But, there are some bodily processes that require some degree of conscious thought. Eating is one of them. Daily, people show up in my radiology department for a swallowing evaluation. Often, these patients are much younger than they should be. Their common complaint is that food gets “stuck” while they are eating. Then, while motioning to their neck, they say, “around here.” A common fear, is a blockage, a hidden cancer, which is almost never the case. During my examination, I am able to see that food isn’t sticking, but rather “mishandled” by the esophagus, the muscular tube which delivers food from the mouth to the stomach. The technical term for this is called dysmotility. This tube relies on the coordinated effort between different groups of muscles and nerves in the upper chest, to propel the food properly. If this coordination is awry, some food gets left behind, typically in the upper esophagus. Eventually, gravity will allow the food to fall to the stomach. Drinking liquids can help bring it down a little faster. As we age, this discoordination becomes common. But, could it be that by not paying attention to our meal while eating, that muscles are losing their coordination in younger people? I think this is quite possible. If you suffer from this type of condition, turn off the TV and put away your devices while you. Relax and pay attention to what you are eating. Visualize the food being pushed to your stomach with ease. Master it, like any other activity at which you excel. It may take a few weeks to normalize, but I suspect your swallowing problems will turn around. If the sensation of food sticking doesn’t resolve after becoming conscious while you eat, take a trip to to your doctor to investigate this problem further. Particularly, if you currently or have previously experienced reflux symptoms, such as heartburn, in the past. Although less common, there are other causes for food sticking which can be caused by obstruction, which may need to be diagnosed and treated. 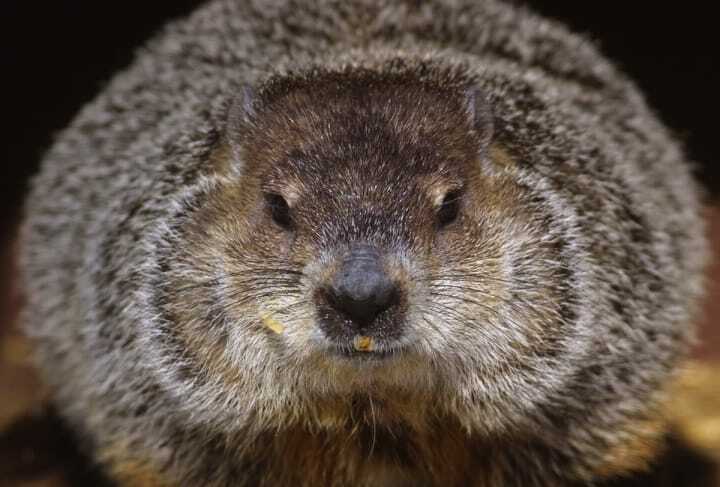 Phil saw his shadow this year, so the word in Punxsutawney is that we have 6 more weeks of winter. Weather in Western Pennsylvania, however, has been erratic and anything but usual this year. Today there were snow flurries, but a few weeks ago, we had a long stretch of temperatures reaching into the upper 60s. It was so warm, many deciduous trees looked as if they were going to start budding. Why do we value a 6 year old groundhog’s observation when we have 50+ year old trees to learn from? 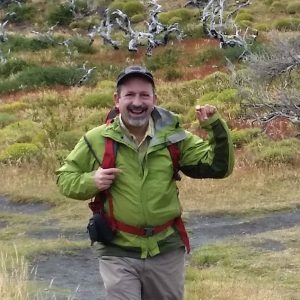 With an understanding that the global climate is changing, most of us have information that Phil and most trees don’t know. Trees might think that these blocks of abnormally warm winter days indicate that spring is around the bend. Some are waking up too early. Trees prepare for wintertime slumber by taking steps to protect them from harsh freezing temperatures, particularly in northern latitudes. Most are familiar with the visual display of impending dormancy by the majestic tree losing its leaves in the fall. Trees, particularly older trees, have been around in a single, uninterrupted lifespan for much longer than many of us people. I take pride in following their lead. Mature trees have lived through many long, dark winters and have usually been able to sense when it’s safe to awaken and sprout their leaves. My understanding is that this process is guided by both a circadian rhythm of light and dark as well as warmer temperatures of springtime. Why Does it Matter When Spring Starts? One of the tricks for staying healthy in the wintertime is to not “catch a cold”. I used to think that a cold was some type of bug and that catching a cold meant catching the cold virus. But there are hundreds of different viruses that can cause the “common cold” and they are pretty much everywhere. A more helpful expression is to not “catch cold”. It has been shown that if you catch cold and let your immune system off guard, you can inadvertently find that you have been hosting a virus which has suddently found it easier to replicate in your cold nose, throat or lungs. Viruses aren’t really alive and they aren’t really dead. But, they can be considered to have a sort of consciousness in that they can mutate and occasionally wreak havoc if a host immune system is off guard. The aim is not to let a virus take hold of your body and “make you sick”. One of the ways to keep the body warm in the wintertime is to wear an undershirt each and every day. Even though there are increasingly common warm days in the midst of winter, I keep an undershirt on for I know my body is still used to having an extra layer of insulation. Yes, I let the trees guide me as to when I should change my wardrobe from winter to spring, and back again. Animals slowly build up their winter coats, a gradual transition which is hard to emulate. Trees however, lose their leaves quickly, providing a clear signal for me to start wearing an undershirt. Spring leaf sprout is my indication that it’s safe to put away my undershirts for the season. I try to make sure my kids wear their undershirts on warmer winter days too for I know from experience that if they don’t, I’ll probably be nursing them back to health the following day. Given a day of warmth in the midst of winter though, kids think it’s “cool” to wear as little as possible. This past January, I drove by students waiting for the early morning school bus wearing light jackets. I did a double take as I passed one child wearing shorts. It was relatively warm out that day, but chilly enough to “catch cold”. Groundhog day left us with the proclamation that spring is 6 weeks ahead, but I’d suggest looking at the trees to determine whether Spring has arrived and to determine when it is time to take off your undershirt. Until then, stay warm and, as your mother might have suggested, stay out of drafts. Finally, if you want to do your body’s immune system a real favor this winter, drink plenty of water, and supplement your diet with Vitamin C, Vitamin D and Zinc, daily. Take care of yourself physically the remainder of this year’s wintertime by staying warm, hydrated and well nourished. Grace and her husband, JB, are both wonderful friends and accomplished physicians. Their home is reminiscent of a rejuvenation spa with a relaxing, health conscious atmosphere. Attention is paid to every detail. From organic food and air purifiers on each floor to house plants, essential oil bathroom sprays, and organic soaps, I always leave their home with new ideas for my own. During my most recent stay with them, I gained a new appreciation for the Himalayan salt lamp. My first morning, I awoke before the sunrise. I navigated the dark bedroom carefully and as I opened the door, I became subtly bathed in a warm, inviting reddish glow. 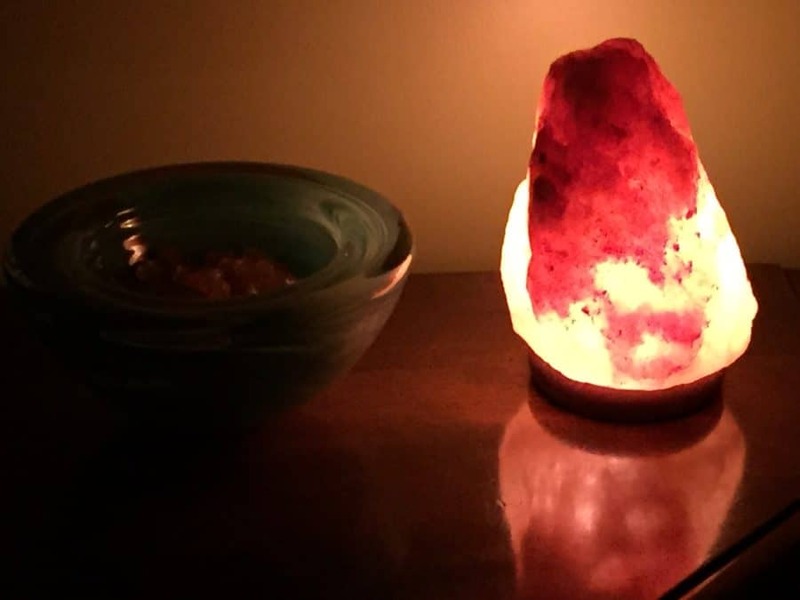 On a hall tabletop sat a Himalayan salt lamp. I hadn’t noticed the crystal the day before. At 5 am, though, this lamp created a memorable and favorable impression. It created a tranquil light especially appreciated at this early hour. Bleary eyed, the light filled me with joy. I purchased a salt lamp many years ago and placed it in my office. During stressful days, I plug in the lamp to help me stay calm amidst the chaos at work. When the lamp is turned on, coworkers will occasionally enter my office and comment on how calm and welcoming the room feels. Whether the effect be a real physical reaction to negative ions or a placebo effect doesn’t concern me. The lamp helps me relax. Salt lamps are typically carved from a solid block of salt and hollowed out to make room for a light source. Some manufacturers create lamps with a scalloped recess suitable for a tea light while others contain a small bulb and attached electrical cord. The lamps are attractive in their own right, creating an earthy table top sculpture. When illuminated, they emanate a reddish glow. The reddish glow is a perfect color of light for a hallway or bathroom night light because it has much less of an inhibitory effect on melatonin production than would bluish colored light. Salt lamps have also been attributed to be a source of negative ion production. Although this claim has not yet been verified in scientific literature, the relaxation effect created by the lamp is similar to that serenity experienced with other locales known to be associated with a greater concentration of negative ions. Atoms, the building blocks of our world, commonly become charged. The acquisition of a charge turns the atom into an ion. A charge allows ions to form bonds with each other. Negative ions, referred to as anions, are attracted to and form chemical bonds with positively charged ions, also known as cations, forming molecules. Ions are a ubiquitous component of the natural world. Moving water is a known source of negative ions. Plants undergoing photosynthesis are another common source of negative ions. Most people are familiar with the sense of relaxation associated with a walk through the forest, a trip to the beach, or by sitting next to a running stream or waterfall. In a typical home, the only sources of negative ions are houseplants and running water filling a sink, bath or shower. Research has shown that negative ions promote relaxation and improve mood. In the 1980s, several papers were generated discussing a reversible phenomenon known as “serotonin irritation syndrome” in which anxiety worsened when people were exposed to positively charge ions. This effect however was reduced with exposure to an increased concentration of negative ions. Serotonin, a neurotransmitter within both the brain and body, is associated with many functions, including mood regulation and is thought to be affected from exposure to charged ions. Some who suffer with asthma have reported a sense of improved breathing and a decrease in asthmatic exacerbations when exposed to negative ions, perhaps by a possible cleansing effect on the air. This effect, however, has not been proven. I’ve been a fan of Himalayan salt lamps for years. Regardless of scientific validation, I have found these light sources to induce a sense of calm and relaxation. Although I have been using a salt lamp at stressful times during the work day for years, I have gained a new appreciation for them, now as a hallway night light! The instant I stepped down awkwardly on to the rock and felt my knee “squish”, I knew there was trouble. Quickly, the knee swelled and stiffened. Thankfully, it was the last day of vacation. After a week of self medication with Advil, I gave up and went to an orthopedic surgeon. He expressed concern about the meniscus and prescribed me a 6 week course of a potent anti-inflammatory. The pain improved and the swelling subsided. But, an unnerving twinge continued to plague me with certain movements. Stepping on the clutch in my standard transmission car continued to be particularly bothersome. A few days after finishing the treatment, the pain returned and then worsened. At my follow up appointment, the surgeon offered me a choice of physical therapy, another round of anti-inflammatory medication, or arthroscopic surgery. This rebel of the medical establishment handed me two metallic discs and explained that his wife was a distributor for a Japanese company called Nikken that manufactures magnets. It sounded like a “woowoo” treatment, along the same line as snake oil. But, I had nothing to lose, so I let him tape the two discs onto my hurt knee. I kept those magnets on for the rest of the day. It wasn’t until I was halfway home that I realized I hadn’t felt any twinges of pain while shifting gears. I continued to wear those magnets for two months. No weakness. No pain. No medication. No surgery. And, today, 25 years later, no arthritis. Since that fateful day, I have used magnetic products over and over again on myself, family, and friends. In fact, a whole shelf in my medicine cabinet is dedicated to this technology. I have accumulated an assortment of sizes and strengths of round magnetic discs, wraps, insoles, jewelry, and even spinning varieties that penetrate deeper into the body. 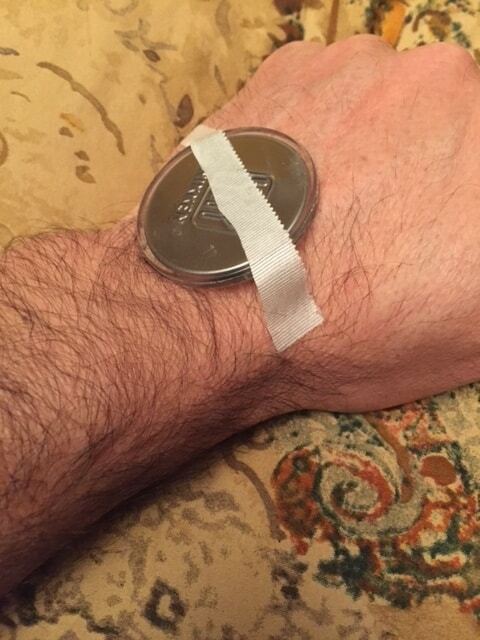 My first mode of first aid is usually to tape a magnet onto an injury. From experience, I have learned that this will almost always speed up the recovery time and often without the need for other medication. The trick is to know when to use a magnet and when to go to the doctor for a more formal evaluation. That, unfortunately, cannot be taught on a blog post. If one hears a noise during an injury, the suspicion should be raised for the need of a professional medical assessment. Tendons snap, ligaments pop, bones crack. Visible deformity, numbness, and severe weakness should also direct one to seek a medical professional at an emergency room or urgent care center. An inability to fully move a joint due to a sense of “locking” or a feeling of “instability”, will also more than likely require a doctor’s evaluation, but not typically as an emergency. Most strains, sprains, bruises, and other localized injury, even lower back pain, can often benefit from the application of magnets. I have even observed fractures heal much more quickly than expected following the application of magnets to a cast. Nikken’s magnetic products penetrate and infuse the body with a magnetic grid. Blood flow improves and… the rest is seemingly magic. I imagine that the magnetic framework helps the body to heal itself, similar to scaffolding workmen use to repair a damaged edifice. I have no experience with other brands of magnetic technology and therefore cannot comment on their effectiveness. It is important to understand though that magnets aren’t “medication”. In fact, the FDA forbids magnet manufacturers from claiming that these products heal or cure. Despite not clearly understanding how they work I can tell you unequivocally, as an orthopedic radiologist, that these strange discs from Nikken help the body heal, and often without any additional medication or treatment. An anti-inflammatory with no side effects. No needed prescription and no concern for refills. In fact, unless you lose them, they seem to last forever. I watched the scene from across the room and chuckled, remembering the rule from childhood. The candy covered fruit was delicious. I understood why she didn’t want to waste even one piece. On one other recent occasion, I witnessed someone claim a “two second rule” before ceremoniously brushing off and eating a fallen morsel. I imagine that this person thought two seconds was a safer window than three for retrieval. 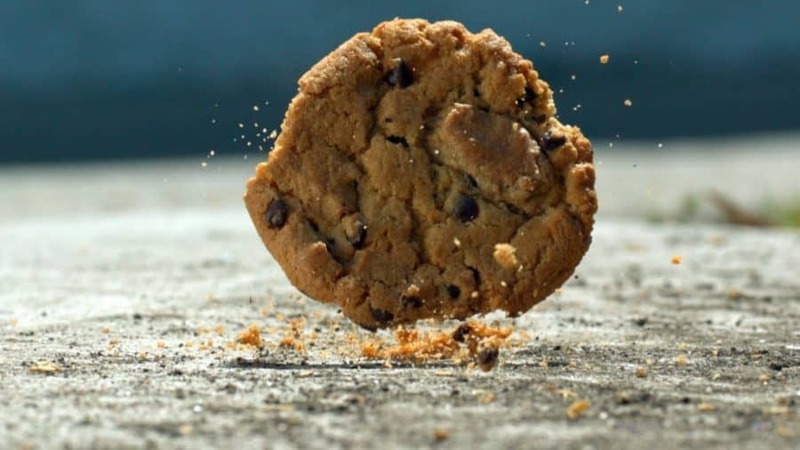 The rule, more commonly called the “Five second rule”, is based on the notion that bugs on the floor, seen and unseen, will not have enough time to crawl onto a piece of dropped food if the edible is picked up within 5 seconds. I suppose this rule would be somewhat true for tiny insects like ants. But, bacteria don’t scurry, bacteria stick like grains of sand adherent to food dropped at the beach. Researchers at Rutgers University recently proved that bacteria can stick to food the instant it hits a floor or dirty counter top. Furthermore, they clarified that the wetter the food and the longer the surface contact, the larger the number of bacteria that will become attached to the food’s surface. Whereas I agree that eating food off the floor in a public place is risky, bacteria living in one’s home could be considered an extension of one’s microbiome and should usually not cause disease. All bets are off though if family members and guests wear outdoor footwear into the kitchen. Consider that unknown bacteria and viruses can be transported to the kitchen floor along with outdoor chemicals including pesticides, petroleum residues etc. by footwear. In addition, be on alert if cooking with ingredients such as poultry possibly tainted with disease causing bacteria such as salmonella or E. coli. If contaminated chicken, for example, is placed on a countertop before it is cooked, bacteria on the chicken can contaminate the countertop. If bread is then placed on the countertop where the raw chicken had been, the bread can pick up the bacteria left by the chicken. This is called cross contamination. Unlike the chicken, the bread will not be cooked to a proper temperature to kill off the bacteria and may cause disease if eaten. Similarly, one sneeze can deposit a film of bacteria or virus onto a countertop surface and cause food contamination if someone in the home is ill. If you consider your floors and countertops to be sanitary and clean enough to eat from, evaluate the ingredients within your cleaning agents. Many floor cleansers and countertop sprays not only remove dirt and accumulated grime, but contain harsh chemicals that will kill off nearly all types of bacteria, mold and viruses, creating a nearly sterile surface. Toxic residues from these products may stick to a dropped piece of food and be could damaging to one’s health. In our home, we do eat an occasional piece of food from the floor. We frequently clean the kitchen floor and counters with edible household ingredients such as vinegar, water, salt, lemon juice and baking soda. In addition, we take our shoes and sneakers off at the front door and ask guests to do the same. Finally, if you are seated at a festive dining table covered by a freshly dry-cleaned table linen this holiday season, it is best if you don’t eat food that has been placed or dropped onto the cloth. Dry cleaning chemicals are known to be very toxic and can also quickly leach into a piece of food. A bit of friendly advice to help you stay healthy and enjoy the season that much more. Ascending the stairs, I was struck by a sense of nostalgia but also an increasing uneasiness. Was it because it had been years since we had last visited? Our welcome was lukewarm. We entered the guest suite and plopped our bags down. My step mother had tossed a pile of towels on the floor for use during our brief stay. I felt anxious. The last time I had stayed in this room, beautiful Lake Tahoe showed in the window. Now though, the view was obscured by a McMansion which had been erected on the neighboring property. I missed the view, but what bothered me more was the presence of a small black box on the nightstand next to the guest bed. It had a series of lights, some of which blinked. It was a wifi router. After freshening up from our long drive, we sat in the living room, the room beneath the wifi router, and listened to our hostess complain of her worsening headaches, debilitating tinnitus and increasing anxiety which had plagued her for months. My father too had been suffering poor health and had been recently diagnosed with an arrhythmia. The thought crossed my mind that they might be suffering health effects related to EMF toxicity. Although we weren’t sure if the strongest EMF was coming from in the house or from a neighbors house, I suggested some steps they could take to reduce their exposure. My initial recommendation was for them to move the router away from all sleeping areas. Electromagnetic Frequency (EMF) is a form of energy that has led to all kinds of technology from microwave ovens and Wifi to cordless phones and cell phones. Some dream of a day when wireless technology will be available everywhere and able to control everything. Alarm systems, watches, exercise monitors, and “smart” meters that utilize EMF to transmit information to utility companies are some examples of the diverse applications that utilize EMF. Although for most, EMF is undetectable by the senses, EMF can be measured by an EMF detector. Check out this brief video to get a demonstration of the EMF emitted from a portable phone system. If people could hear or, in some other way, sense EMF, I suspect most move EMF sources as far away from their living space as possible. Certainly no one would try and sleep next to a router or a portable phone. EMF is a form of energy that can be absorbed by the human body. Many physiological effects on the body have been documented in the peer reviewed literature. Some effects, such as an association with developing cancer, are controversial, but other effects, such as a decrease in sperm count following cell phone placement in a man’s pocket, has been scientifically proven and confirmed by further studies. I think of EMF as waves of energy, similar to the ocean’s waves. Waves can be entertaining and provide a means of effective communication and information transmission, but one needs to get out of the waves to rest. All sources of EMF in and near the bedroom should be turned off when one is ready to sleep. 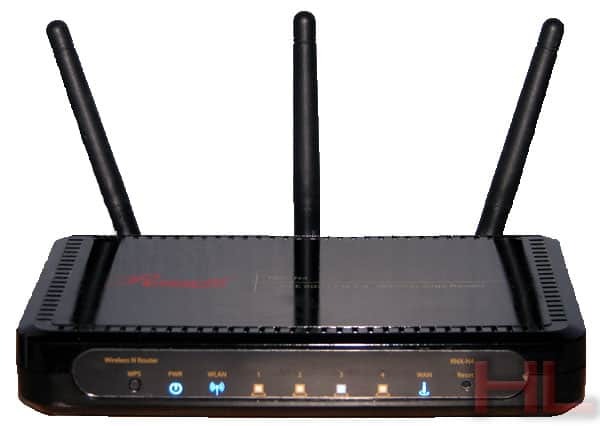 This can easily be done by putting routers on timers so that they automatically turn off at night and turn back on in the morning. Portable phones, particularly base stations, which emit EMF incessantly, should be kept out of the bedroom while one sleeps. My hosts in Lake Tahoe purchased an EMF detector for their own personal discovery and uncovered several unexpected sources of high EMF in their living space, including their refrigerator. They took steps at mitigation, and I haven’t heard any complaints from either of them since. There are many sources of EMF within the house and sources from outside the home can penetrate through windows. By removing sources of EMF from your bedroom, you will give your body the ability to truly rest while you sleep and perhaps improve your health. As I mowed the lawn yesterday, I must have killed at least 100 bees. They were all over the little white and purple flowers springing up from the clover. I am hoping most of them heard the tractor coming or felt the ground vibrating as I approached. Some bees did fly off before, snip, their flower was cut off at the stem. I used to feel guilty about killing the flowers, but of course a few days later, more flowers would open up and the bees would find new sources of nutrition. The other insects living in the lawn weren’t so lucky. A swarm of about 7 birds dive bombed the insects as they flew off of the ground cover as I came by. The birds came precariously close to me as they tried to eat as many bugs and insects as they could. This used to make me nervous, but now, I enjoy the dance. I like feeding the birds this way. They aren’t my pets, but I think they know me. From a distance, my lawn looks beautiful. It’s green and a host to all kinds of birds, reptiles and small mammals. 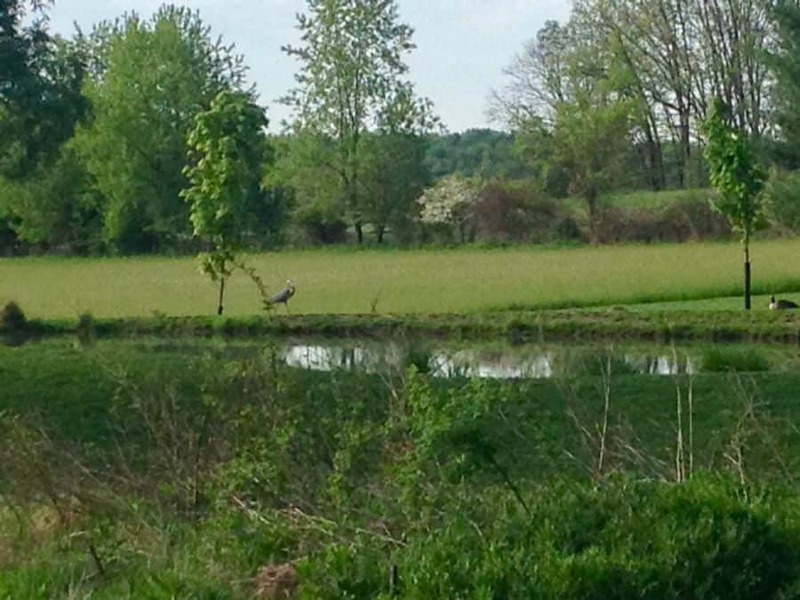 Last weekend, while walking on the property with my sister, I even saw a crayfish crawling on the lawn. Up close though, my lawn is varied with spots of grass, areas of clover, and infiltration of all other kinds of “weeds”. It’s a hodgepodge of life. Aside from mowing, my lawn is low maintenance and essentially free. I don’t pay for grass seed, fertilizers, herbicides or pesticides. Areas of my lawn are kept overgrown so that the bunnies have a place to hide from predators. One of my neighbors has a pristine lawn. It is a beautiful shade of green and composed of identical length blades of grass which he mows daily. He has perfected the diamond shaped grid pattern. The only thing missing from his lawn is life. To perfect his grassy expanse, he sprays it with all sorts of chemicals to kill weeds and insects. The birds have nothing to eat from his lawn. The deer and rabbits would probably get sick if they ate his grass. Their household doesn’t include a dog, but if it did, I’m not sure how all the toxins in the lawn would affect the dog’s health. But, the grass sure looks pretty. Sometimes when we understand where habits come from, we can undo them. People are very touchy about their lawns. A well manicured lawn of homogeneous grass blades is a symbol of status and pride and a source of judgement for circles of social consciousness. Where did the manicured grassy lawn concept come from? The same place where the “I just want to have a house in the country with a white picket fence” came from, Levittown. This was the first American suburb created in the late 1940s. Maybe it’s time to give up on this quest for the increasingly toxic green grassy lawn. Our insects, birds and mammals need food. All components of a healthy lawn should be edible for some form of life. If you want a fragrant lawn, plant chamomile and thyme like they used to do around the old English and French castles in the 16th century. Your lawn will be the talk of the town until everyone else follows your lead. Are You Slowly Going Deaf Exercising with Those Ear Buds? Walk through any gym, and you’re likely to see people on the treadmill or working out, listening to music through a set of ear buds. Most people don’t realize it, but the combination of exercise and loud music can cause you to slowly go deaf. We have been working out to music for decades. Years ago, music was a shared experience, played in the background. In fact, some based membership decisions on the type of music played at the gym. MP3 players like the Walkman and then the iPod came around, and everything changed. These devices, when used with ear buds, block out extraneous noise while delivering music directly down the ear canal. Seems like a great idea, but ear buds have been shown to be able to wreak havoc on the inner ear. When young, I mistakenly thought that when people became deaf, it was because their eardrum popped. Whereas this can happen with an extremely loud noise, such as an explosion, this “all or none” effect isn’t the typical way one loses their hearing. More commonly, it’s a slow, insidious process, called noise-induced hearing loss (NIHL). This form of deterioration can begin at any age from childhood through old age. This is a preventable form of hearing loss that occurs from repeated exposure to excessively loud sound. NIHL is a common condition. The National Institutes of Health report that approximately one out of seven Americans (15%) aged 20 to 69 have hearing loss related to occupational or leisure activities, presumably from chronic exposure to loud noise and/or music. People with this form of hearing degeneration initially present with the inability to discriminate between different sounds or a hypersensitivity to certain sounds. Ringing in the ears, referred to as tinnitus, can also occur. Eventually, a hearing aid is needed. Hearing requires more than just an intact eardrum. The ear is the first part of an apparatus that first converts vibrational waves of energy into mechanical vibration and following, into electrical impulses which travel from the inner ear to the brain. The brain is where we interpret this information as something we call “sound”. The switch from mechanical vibration to electrical impulse occurs within a structure of the inner ear called the cochlea. The cochlea is filled with fluid and contains a collection of cells with tiny protruding hairs called cilia. Mechanical vibrations transmitted within the fluid cause the cilia to vibrate. The cells housing the cilia change this mechanical information into an electrical nerve impulse which is then transmitted to the brain. Each time we are exposed to excessively loud noise, tiny blood vessels that supply the cells in the cochlea constrict, diminishing its blood supply. If the blood supply is reduced too drastically, the cells sporting the cilia can die. Once they’re gone, they’re gone. They can’t grow back. Where does exercise fit in? During exercise, blood is diverted to the body’s active muscles that need oxygen and nutrients. This redirection of blood will cause a decrease in blood flow to the cochlea. By itself, this is not a problem for the cells in the cochlea. But mix loud music with exercise, and there is a compounding effect on the blood vessel constriction, doubling the risk for damage. More damage leads to more eventual hearing loss. The maximum sound intensity that is safe under normal activity and health is 80 decibels. This equates to the noise level generated by running the vacuum cleaner or garbage disposal. Sounds over 85 dB can cause hearing loss. In general, if you are wearing ear buds and can’t hear when someone is talking to you in a normal tone voice, the volume is probably turned up to loud. Listening to music while exercising can give an energy boost. We become entrained with the music and as a result, it motivates us to move and perform with the rhythm. The good news is that the music doesn’t need to be loud to receive this beneficial effect.